A brief survey is given of how to deal with nerve trauma. First, the important Sunderland classification of the five possible degrees of nerve lesion is outlined; second, the reaction of connected tissue within and around the nerve as a secondarily disturbing factor is discussed. The time span between nerve injury and potential or expected regeneration signs is argued to remain the main problem when dealing with nerve trauma. For the investigation of regeneration, we always emphasize to elicit the Tinel sign which slowly moves downwards with growing axon sprouts. By means of modern high resolution ultrasound, a neuroma in continuity or a stump neuroma will be detected perhaps more frequently and earlier. Therefore, our hope is expressed that easily available imaging techniques will influence our decision making in future. 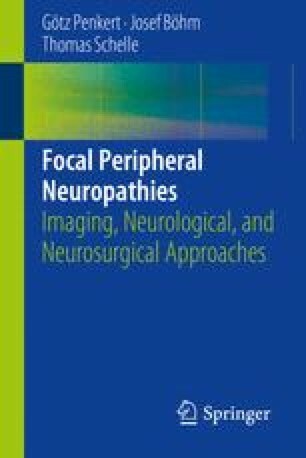 Principles and techniques of nerve repair by autologous grafts are then described followed by special remarks on the ongoing challenge to improve the property of artificial implants. Finally, comments are made on positive and negative arguments regarding the application of postoperative electric muscle stimulation.